Thanksgiving is right around the corner and with the parade of families arriving and food being prepared the most important question needs to be answered... What the H-E-Double-Hockey-Sticks am I going to wear? Well, you are in luck and you are welcome for having your own personal stylist this Thanksgiving. I have put together the perfect Thanksgiving outfit and for most of you, you will already have all these pieces in your closet. The best part about this look is the perfect balance of something special and casual everyone is looking for during the holiday season. It really walks the line, haha. For me, these pieces are absolute staples, must-haves for every closet. First, the basic v-neck, its cotton and can be purchased at any store H&M, Old Navy, Target, you name it it's there. I am wearing a dark gray cotton v-neck from Old Navy, I love them because they are tagless and come in every color. I went with gray because I am terrible at wearing white I talk a lot with my hands. =( I do not recommend white for the holiday's too many chances to spill. No one wants their night ruined because red wine was spilled down the front of their white shirt. The next piece is this gorgeous plum pleated midi skirt with lace trim. 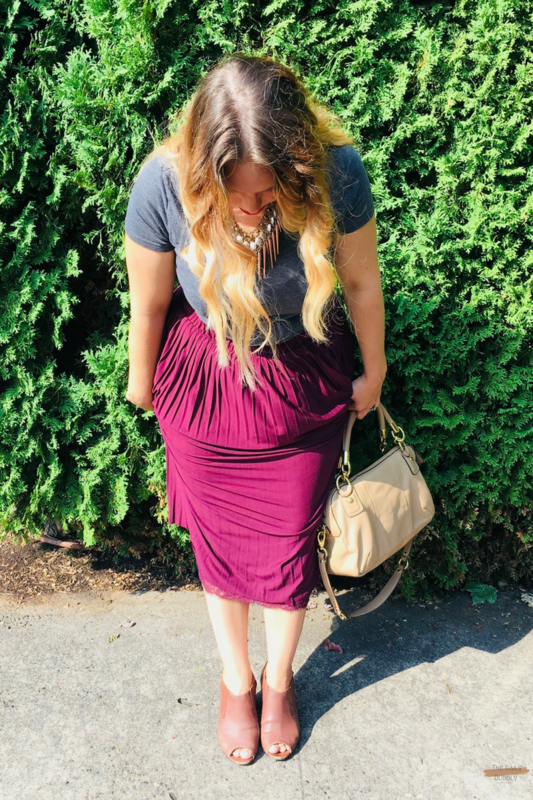 This skirt was a major score for my closet, I absolutely love the color. The color is especially lovely for holidays the jewel tone gives the outfit a pop. Plus a darker color on the bottom makes you look trimmer. The midi-length of the skirt is so feminine. You can partake in all the wonderful holiday tasks like the herding of children, playing games and even help clean up those spills caused by herding children who were playing games. What makes this outfit so special is how balanced the overall look really is and I think the heels really pull it together. Trust me I have thought of everything and my feet are one of them. I am in love these brown leather peep-toe heel, plus you have probably seen them on the blog before. The height makes them super comfortable 2.5/3 inches and they have a thicker heel. Do you have multiple holiday parties to hit up one night? Not a problem your feet will feel great. Also, the coverage of this heels makes it great for the colder weather and still look super cute. Grab your favorite statement necklace something with a little bling to it! If you are feeling brave you can switch the statement necklace out for a silk scarf. Here is a link to learn how to tie the perfect neck scarf. How very French of you... ;) Again you are welcome. I love a medium size handbag for holiday occasions. That way you have room for anything you may need to carry, holiday cards, small gifts, even a bottle of wine. I usually do not color match my bag and shoes but I do want the items to coordinate. This time I pick two shades in the same color family. Plus a lot of the time the bag ends up on a coat rack in the corner or under a bunch of coats in the guest room. Whichever way you chose to go classic sophistication or glam rock classic red lip or plum purple... Family or Friendsgiving it's only about one thing, being with the people you love. Okay well, two things the blah blah blah people you love and having the perfect Thanksgiving outfit.